Don't leave home without the WaterBoy Pet Drinking Container. Quench your pet's thirst with this spill-proof canine or feline must-have. 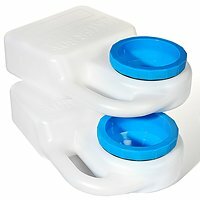 The WaterBoy's creative design prevents contaminants from entering your pet's drinking water, helping your pet stay healthy and active. And we're including 2 to ensure that you always have a fresh, clean one ready to go or have enough water for more than one pet.